Author Wallace Akin, who passed in 2012, was one of the last living links to the most disastrous tornado in American history. He was a two-year-old toddler in March 1925 when the record-breaking twister devastated his hometown of Murphysboro, Illinois, and lifted his home off the ground, a la The Wizard of Oz. While in his mother's arms, he went airborne in the maelstrom. Unlike the nearly 700 others who perished in the 219-mile-path-tracked storm, Akin's family luckily survived, and stories of the tornado formed the core of his family's lore for the rest of this life. It spurred his career in meteorology and in writing weather textbooks. Although somewhat repetitive (sensational as it may be, accounts of people being impaled or decapitated by weaponized debris for page after page holds my interest for only so long), this is about as good an account of the tornado one can expect to find. Akin did extensive research, and peppers his account with nice personal touches that can only come from someone who experienced the event firsthand. Akin's feel for the fauna and history of his stomping ground (he mentions playing among places still scarred by the tornado as a child, for instance) elevate this one above the usual disaster narrative. One wishes Akin had spent less time writing textbooks and more time honing his creative writing, because in this book he shows much elan and evocation in his style. With some practice he could have become, I believe, a notable regional writer in the manner of Jesse Stuart or Wendell Berry. Two caveats. 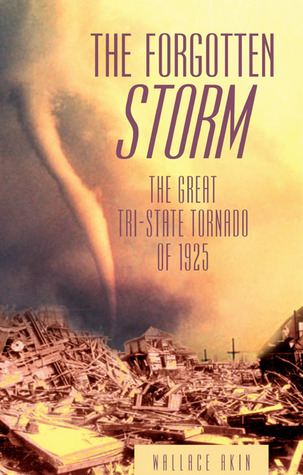 One, the Tri-State Tornado is hardly a forgotten storm, despite the book's title. Two, no photos exist of the tornado, so the photo used on the cover is pilfered from some other event. FYI. Akin finished this book a decade before his death at the age of 89. Glad he managed to provide this valuable record just in time. Sign into Goodreads to see if any of your friends have read The Forgotten Storm. 12.0% "Most tornado books are a mess, but so far this author is killing it. Eagerly moving forward." I'm from the Northeast myself, and maybe my provincialism came through in my initial confusion over 'tri-state', which around here means New Jersey, New York and Connecticut. Then again, we don't get too many tornadoes. It's really fascinating how that encounter with the tornado as a child seems to have impacted the rest of his life. I wonder how many Midwesterners have had similar formative moments with tornadoes, influencing their lives in all manner of unknown ways. Mike wrote: "I'm from the Northeast myself, and maybe my provincialism came through in my initial confusion over 'tri-state', which around here means New Jersey, New York and Connecticut. Then again, we don't g..."
Anyway, yeah, well this storm might well have put the fear of God or whatever into all who experienced it, as the book points out -- people for years thereafter had profound dread over every thunder storm. This thing came over the horizon suddenly and came on fast, 70 mph in forward motion like a furious rolling black veil, not a funnel per se. It was likely a rain-wrapped massive wedge with satellite tornadoes, and probably a tornado family -- something that weather nuts debate today. There was no warning and no time for anyone to grab a camera to visually document it, and back then Missouri/southern Illinois/southern Indiana were remote off the communications grid. It undoubtedly was a profoundly catastrophic event to have been a part of, and ingrained in the collective psyche of the people of that region for a generation or so. '...A furious rolling black veil', Christ. The speed and the lack of advance warning must be one of the most terrifying qualities of tornadoes. I'm guessing that 'satellite tornadoes' are spawned from one major tornado, while a 'tornado family' is more like tornadoes that simply travel in a pack?